1 How to Control Your Level of Cholesterol in the Blood? 2 What is Normal Blood Cholesterol Level? Of course, we have all feared the dread of high blood cholesterol. As fearsome as the prospect has always been, in the recent days, it has been deemed by medical science to be a looming discord in human health. One of the marks of fitness is to staunchly keep your blood cholesterol level under control. Not only is it highly inconvenient for your stamina in general, it can lead to a plethora of health issues, not the least of which is a heart attack. Of course, there are ways to counter this possibility. You can control your diet and include at least a minimum amount of exercise into your lifestyle. A brisk walk in the morning or evening can work wonders. 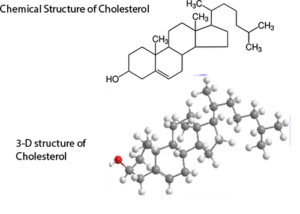 Cholesterol is basically, an organic molecule. It is a kind of lipid molecule that is required to preserve fluidity and the structural integrity of the membrane of all animal cells. Further, it is useful for the biosynthesis of steroids, hormones, and bile acids. However, since it is essential for maintaining the vigor of a human or animal body, it is biosynthesized by the cells. The average human synthesizes about one gram of cholesterol per day and the body itself has about thirty gram of it, primarily contained in the cell membranes. How to Control Your Level of Cholesterol in the Blood? One of the most recommended processes of lowering your blood cholesterol is to limit your diet. You should control the intake of food rich in trans fat, saturated fats and dietary cholesterol. Partially hydrogenated fat in the ingredient list indicates that it has trans fat. Food products like red meat, egg yolk, full and even low-fat substances, coconut and palm oils, organ meats and shellfish have saturated levels of cholesterol. However, the Omega-3 fatty acid is good for your heart as it protects it against diseases. Foods like cold-water fishes such as salmons, halibuts, trout, sardines, herrings and mackerel are rich in this fatty acid. Dr. Tobias Omega 3 meets the TV Dr’s Guidelines of 600mg DHA per day with one serving. What Science Says: Research shows the importance of Omega 3 essential fatty acids for our health. Further, you should increase your fiber intake. 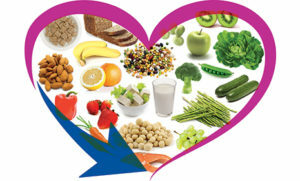 Cholesterol can be controlled through foods that contain soluble fibers. Carrots, beets, okra, brussel sprouts, eggplant are fibrous vegetables that are good for your health. Further, berries, oranges, pears, passion fruit, apricots, apples, and nectarine are fruits rich in fiber. Oats, barley, yams, oats bran, sweet potato and other potatoes, beans and legumes like pinto beans, peas, garbanzo beans and black beans are good for fiber consumption. Plant protein instead of animal proteins is better for your body. Nutritionally rich foods like legumes peas, lentils and beans like soybeans, white beans, red beans and pinto beans are sufficient suppliers of protein that can be preferred over meat. Legumes are known for reduction of the total blood cholesterol, the LDL, insulin and blood sugar, even possibly cancer. Seeds and nuts too reduce LDL cholesterol in the body. However, consumption of nuts should not be over an ounce a day, since it has too much calories. Further, to control the blood pressure levels, it is better to try them unsalted. Not only does the reduction of weight lower your cholesterol, it is good for avoiding the diseases that are prevalent in an urban, industrial society, like high blood pressure, gout, type 2 diabetes, and cancer. Even supposedly healthy intakes of fat like olive oil saturated in calories and that has to be limited as well. Intake of 1 to 2 grams plant sterol supplements reduces the LDL cholesterol levels. Further, psyllium husks or seed grains act as a source of soluble fibers and laxatives. 9 to 10 grams of psyllium every day, reduces LDL cholesterol level as well. If you are overweight, it is likely that you have a higher level of LDL cholesterol level. Not only does exercise reduces the unwanted fat in your body, but further, stimulates the enzymes that transmit the LDL from the blood stream to the liver. The cholesterol is either excreted or converted to bile. Exercise bloats up the protein cells in your bloodstream that carries the LDL. These protein particles can either be small or bloated. The small condensed ones find it easier to enter the arteries and accumulate. Heavy exercise also increases the HDL level in your body. Not only does a high level of cholesterol end up in serious diseases, it curbs the energy level in your body as well. As is evident, lowering the level of your cholesterol by whatever means needed, is very necessary if you want a healthy lifestyle. What is Normal Blood Cholesterol Level? It is recommended that everyone above 20 years should try to get their cholesterol measured. Blood cholesterol is measured through a blood test known as lipoprotein panel that produces the evidence of substances in your blood through which cholesterol is carried, that could lead to heart coronary diseases. The blood test is performed after you have observed a fast of 9 to 12 hours. It provides you information about the amount of cholesterol in your blood in total, including low and high-density lipoprotein cholesterol. LDL or low-density lipoprotein is the primary source which allows for build up of fat and blocks your arteries. HDL or high-density lipoprotein is also known as good cholesterol that helps in cleaning your arteries of the unwanted build up. Further, it is used for measuring triglycerides which are essentially a form of calorie that increases the possibility of heart disorders. For healthy cardiovascular activity, heart health, and improved circulation. To truly keep your cholesterol level under control, you have to maintain it throughout your lifetime and have ideal levels of cholesterol as per your age. The entire cholesterol in your blood, as mentioned is divided into HDL, LDL, and triglycerides. High level of HDL is good for your body. For children, their cholesterol level should preferably be checked between the ages 9 and 12 and once more between 17 and 21. But children who have a family trend of diabetes or generally high cholesterol should get checked between 2 and 8 and once more between 12 and 16. According to the National Institute of Health, the ideal level of cholesterol for kids should be 170 mg/dL or lower. If they have cholesterol levels from 170 to 199 mg/dL, it’s borderline manageable. However, if it is more than 200 mg/dL, it is time for caution. To be more specific, the LDL should be 100 mg/dL or lower. From 110 to 129 mg/dL, it would be skirting the lines and higher than 130 mg/dL is not recommended. Similarly, the HDL level should stay above 45 mg/dL and below 40 mg/dL is not good. When it comes to triglycerides, for children aged 9 or below, 75 mg/dL or lower is suggested and for kids from 10 to 19, 19.90 mg/dL or lower. 100 mg/dL or higher in kids till 9 and for kids from 10 to 19, 130 mg/dL or higher is too high. In adults, the total cholesterol level should be 200 mg/dL or lower. Higher than 240 mg/dL is not recommended. The LDL level should be below 100 mg/dL and not above 160 mg/dL. The HDL level, on the other hand, should be 40 mg/dL or higher and not below 39 mg/dL. The triglyceride level should be below 149 mg/dL and not above 200 mg/dL. However, it is detrimental to keep in mind that every individual has a separate family history and other disorders like diabetes plays a role in your cholesterol level. It would be wise to consult the doctor and consider their opinion on what the ideal cholesterol level would be for you. Even though cholesterol is important for your body, too much of it is harmful. It has no such perceivable symptoms, though. You would need to go for a check up to know if you have a high level of blood cholesterol. Cholesterol is carried by our blood through the lipoproteins. 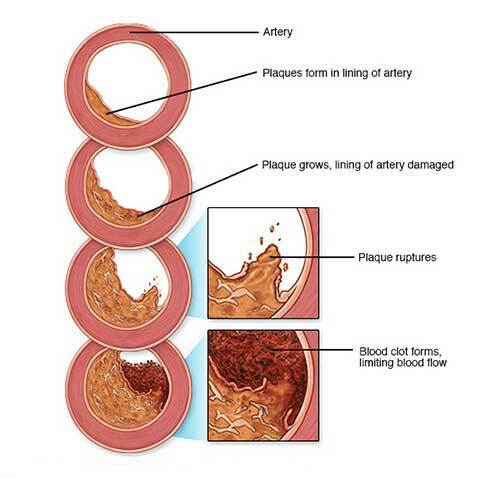 If you have an excess of LDL and little HDL, your arteries may develop a hardened layer of plaque which is made up of a combination of lipoproteins, fat, and other substances. The constant addition of layers to the coronary artery makes it difficult to allow smooth flow of the blood. Moreover, supposing a portion of the plaque breaks open, it ends up in a blood clot that can block the blood flow completely. This evidently is the cause for heart attacks. Lack of sufficient supply of blood to your heart can be diagnosed through chest pain, pressure, and all around discomfort. However, the pain or angina might be mistaken as indigestion. Further, ache in your jaw, shoulders, arms, back or neck may be obvious signs as well. Heart attacks are usually the result of the blocking of blood supply to a section of your heart muscle. It is diagnosed as the death of the heart muscle. If the supply is not restored as soon as possible, the eminent outcome is death. Even as heart attacks are the most obvious disease resulting from high cholesterol levels, another is a brain stroke. Plaque accumulating on the artery walls that supply blood to your brain restricts the blood flow which can result in a stroke. You may feel weak or numb all of a sudden and pertaining to the area of your brain that is being deprived, there might be problems in speaking, moving or seeing. Brain strokes end up in death, disability or brain damage. Blocking of your arteries that supply blood to your limbs, results in either a numb of painful sensation. The tissue of your limbs can catch gangrene or death due to stoppage of blood supply. Further, increased levels of cholesterol can lead to gall stones as well. Accumulation of the plaque in the walls of your arteries blocks the flow of blood to the kidneys and stomach. This leads to Intestinal ischemic syndrome that includes vomiting, blood stools, pain in the abdomen and nausea.